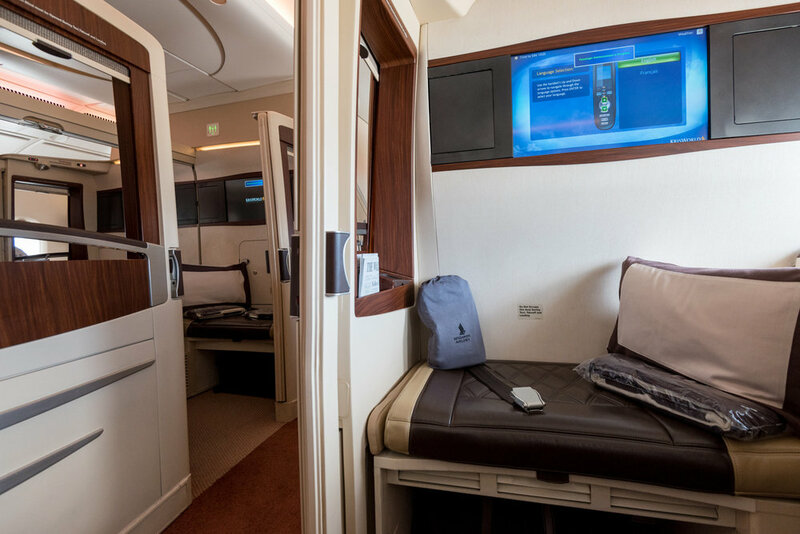 Exclusive First Look at Singapore Airlines' New A380 Cabin Products - Check out the Suites and Business Class! Exactly one week ago, Singapore Airlines confirmed Sydney as the very first route that it will debut the brand new A380 cabin products. The first of the new A380 from Singapore Airlines will operate on 18 December 2017 from Changi Airport's Terminal 3 to Sydney. While there have been alleged leaks of the new Suites and even a seat map two days prior to the official event, it is now apparent that these leaks were indeed accurate and representative of the actual product. 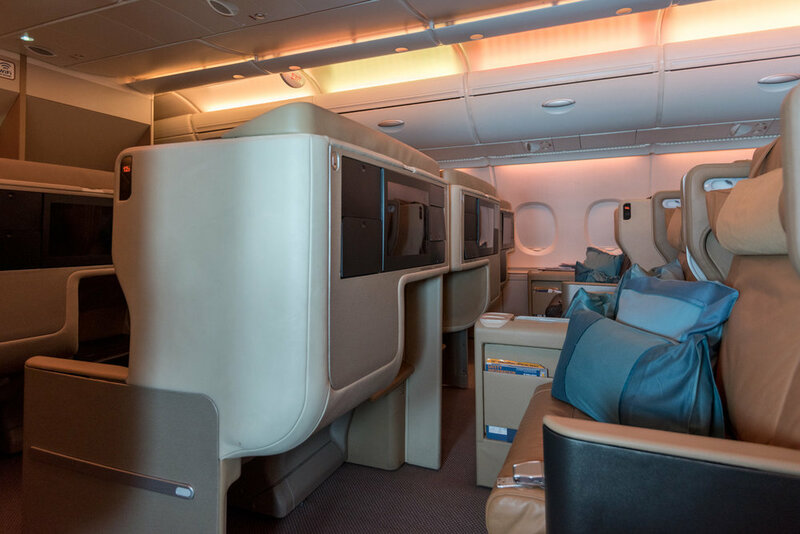 This is an exclusive first look at the brand new A380 cabin products (Suites, Business Class, Premium Economy and Economy) on Singapore Airlines. I have personally flown in the exclusive Suites and Business Class on Singapore Airlines' A380-800 on multiple occasions and while I do think they are excellent products, I am extremely excited to see what Singapore Airlines has up her sleeves in terms of the new cabin products that will be fitted initially on the five new A380s. These products were unveiled to public on 02 November 2017 and Lucky from OMAAT has (somewhat) substantiated that London (LHR) will be the second route to get the new A380 product. 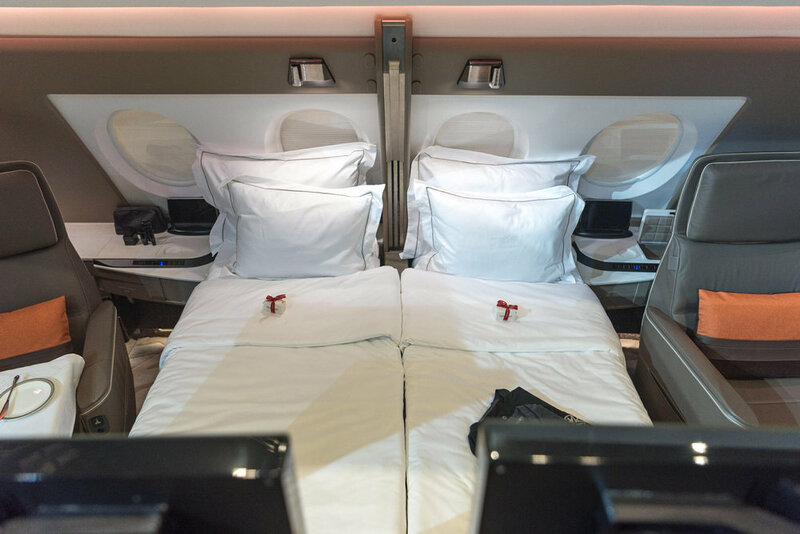 While the width of the seat appeared to have been reduced from 35" to 21", it is very important to remember that the new Suites on the A380 will have both a permanent bed and seat at any given time - there is also more room to actually move around! The swivel seat also provides the flexibility to work on different things - you may face the massive 32" IFE Screen (up from 23") or face the desk if you prefer to work instead. 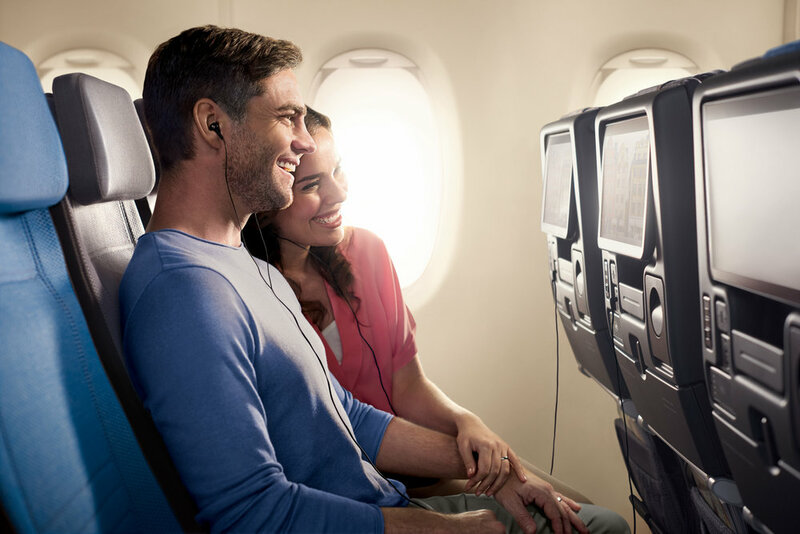 The seat (which also reclines) can be adjusted for different lounging positions and the small 8" tablet on the desk allows you to control the electronic-blinds, adjust the lighting and control the IFE as well. Your Suite will also come with a personal wardrobe and a storage area that will fit a regular cabin-size baggage. 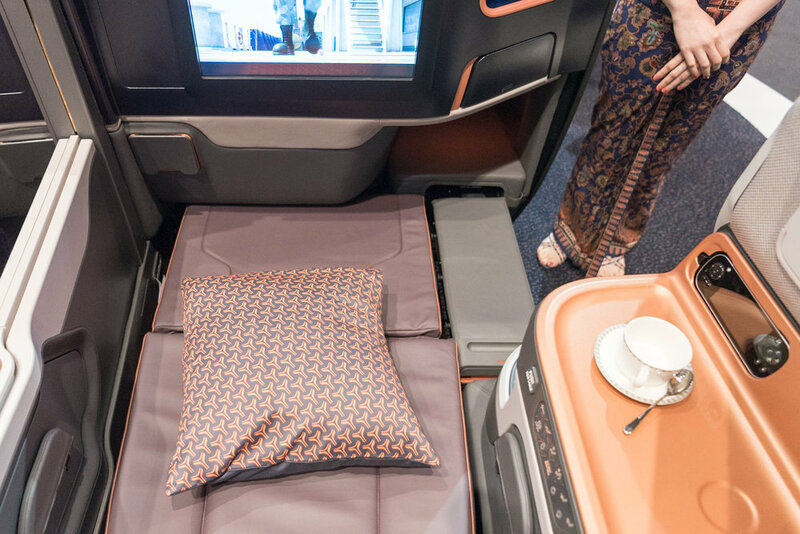 If you are flying with your partner and you prefer a double bed, four out of the six Suites on Singapore Airlines' new A380 can be converted into a double bed by lowering the dividing wall - you are looking at 1A/2A as well as 1F/2F. The dining area will be set up in front of the recliner chair even though at this moment I am not sure if dining in bed can be made possible. The comparatively uncomfortable pyjamas on Suites has also been replaced with a branded Lalique one that is made with a much softer (and thinner) material. Available in four sizes (small, medium, large and extra large), the brand new Lalique Pyjamas has also done away with the zipper that was commonly criticised by luxury frequent flyers. Amenity kits that are currently provided by Salvatore Ferragamo will be replaced with renowned French brand, Lalique. Male and female amenity kits are provided for passengers traveling out of Singapore in Suites or First Class on long-haul. If you are traveling into Singapore on Singapore Airlines in Suites or First Class, you will instead receive a unisex amenity kit (located in the bottom row of the photo above) which comes with a scented candle - no EDT in this one unfortunately! The new A380 Business Class seats are by JPA Design (who also created the iconic Business Class seats on the A350 product) and it measures 25" wide (5" more narrow than the current A380 seats). The seat pitch is also reduced from 55" to 50" but Singapore Airlines claims that it actually maximises the use of space. The Business Class on the new A380 will feature a seat width of 25” and a seat pitch of 50” - the seat reclines directly (no more having to make the bed yourself or trouble a crew member to do it for you!) into a full-flat bed that measures 78”. 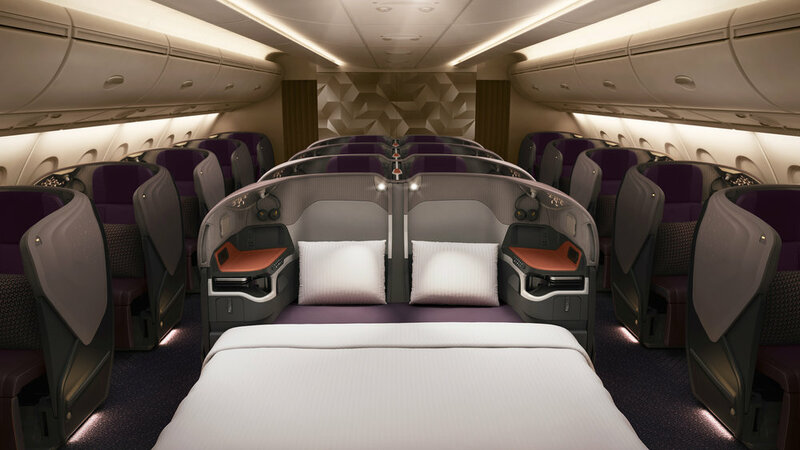 The centre divider between the middle row seats can be fully lowered to create double beds which is truly impressive for Business Class. For a full double bed experience, look out for rows 11, 91 and 96! Singapore Airlines has kept its 1-2-1 cabin layout for Business Class but it has managed to fit in more seats in the same space - there are now 78 Business Class seats on the new A380. There is a dedicated space for you to charge your mobile phone and there is even a beautiful mood lightning (you will notice that the SIA logo is deconstructed here) by your seat. Unlike the older A380 Business Class seats, travellers will now be able to recline their seat into a flat bed without having to flip the seat over. There is also enough room under the seat to stow away your carry-on baggage (even during takeoff and landing). You will also be able to charge your laptop or table conveniently in the literature area of the seat. The partition in between seats can be raised and lowered - there are three different height settings here. Passengers traveling in Business Class will be able to enjoy in-flight entertainment on their 18" screen (no where near as impressive as the 32" in Suites but definitely sufficient). These new Business Class seats will also be found on Singapore Airlines' new A350-900ULR planes when it flies directly from Singapore to New York and Los Angeles respectively in 2018. I do not suppose that there are as many people interested in the PEY/EY products so I shall just let the photos do the talking - remember you should use your miles on J and above where possible! Changes to the Premium Economy product are kept to a minimal (considering how they were only introduced back in 2015). At the time of writing, I was unable to find any Saver redemption (80,000 KrisFlyer Miles one-way) for Suites from Singapore to Sydney but Standard is available at 150,000 KrisFlyer Miles each way. Other routes that are operated on Singapore Airlines' A380 (albeit not the latest cabin products) include Hong Kong, Shanghai, Beijing, Delhi, Mumbai, Sydney, Auckland (Seasonal - Summer), Zurich, Frankfurt, Paris, London as well as between Frankfurt and New York. Retrofit work on the 14 existing A380s will start in late 2018 and it is targeted for completion in 2020.